Although tourism is very important to the Egyptian economy, most Egyptians aren't much interested in their own antiquities. After all, this is the Arab Republic of Egypt, and there are more pressing issues than trying to understand the world-historic importance of the pharaonic past. The situation is comparable to the way tourists visiting India are fascinated by the British Raj--and to the irritation aroused in educated Indians by that fascination. 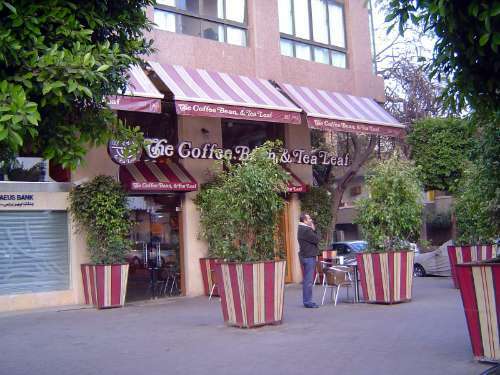 Still, Egypt has a deep past, sampled here with a run-up to the busy contemporary. About a hundred pyramids were built over a period slightly exceeding a thousand years. This particular pyramid is Menkaure's. 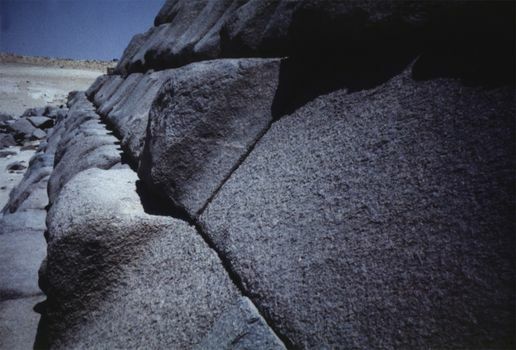 It's the smallest of the three at Giza and unusual in that the casing blocks are of undressed granite, not the limestone of its two immense neighbors. This is the biggest of them all, the pyramid of Khufu (Cheops). With a side length of 750 feet and a height of 450, it covers 13 football fields. Its base deviates less than one inch from absolute rectangularity, and its cardinal alignment is almost perfect, deviating from true north by no more than a third of a degree. 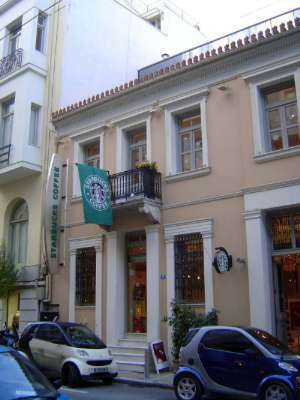 Although the apparent entrance was from temples on the east side, the true (and hidden) entrance was from the north. There, a path led down, then forked. One branch continued down to a chamber in the underlying bedrock, while the other branch rose and then split again. One of those branches proceeded horizontally to the center of the pyramid, while the other rose through a tall, corbelled gallery into the king's chamber, lined with massive granite blocks to support the mass of stone above the chamber. From the chamber, air shafts radiated diagonally to midpoints of the pyramid slope, not to provide ventilation in any mundane sense but to provide a path for the pharoah's soul to ascend to heaven. Remember: the rising sun shone upon the summits, just as it shone upon the earth when land first rose from the sea. The intricacy of the stone work is extraordinary and by no means all arranged like the horizontal blocks visible here. 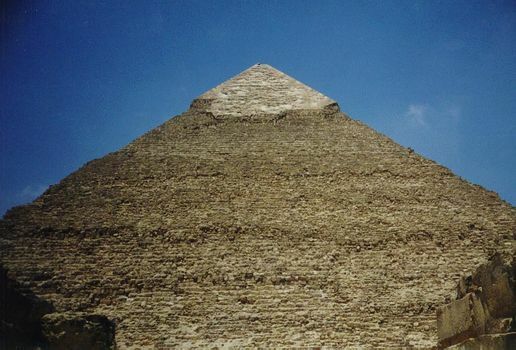 Still, the pyramid is not solid stone: either to increase its stability or reduce its cost, the interior of this pyramid contains irregular, sand-filled voids. Some other pyramids are filled with rubble. Construction methods evolved: those at Giza, like this one, were made partly with ramps and partly (especially up top) with simple machines. 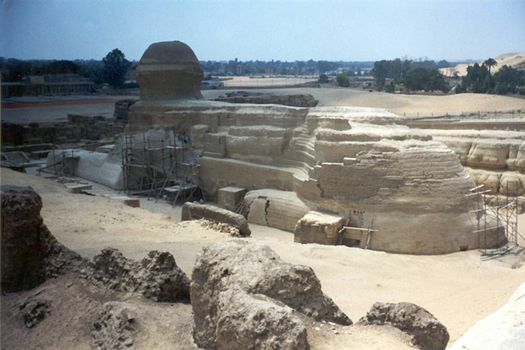 Materials changed, too: earlier pyramids had cores of mud brick, but the two giant ones at Giza were made mostly of two grades of limestone, a hard white stone for the skin or cap and a coarser gray for the core. 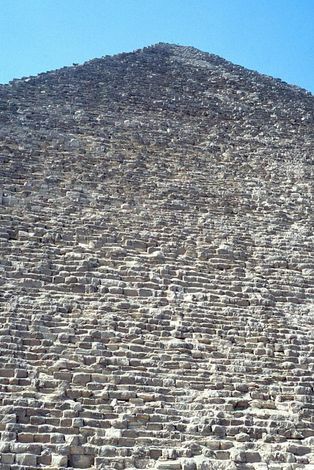 The cap has been entirely removed from Khufu's, but a bit of it remains here, at the summit of Khafre's. 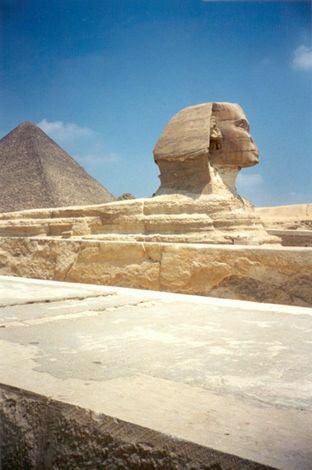 Cleaned up, with the desert sand brushed off her feet, the Great Sphinx at Giza combines a lion's body with the head of either Khufu or Khafre, the builders of the large pyramids behind her. She lies in place, carved from the bedrock around her; in fact, she lies in what once was a quarry from which limestone was taken for the pyramid cores. Length: 235 feet. Height: 64 feet. Date: Fourth Dynasty, roughly 2,500 B.C. A less familiar view, revealing the volume of rock quarried from her flanks. The Sphinx faces east, looking toward the rising sun. Why? She may have been intended as a representation of the Sun God. Alternatively, she may represent pharoah waiting to present an offering to the rising sun. In the background, a bit of Nile Valley greenery can be seen. Contemporary Egypt, but not so unlike the historic country. This is the Faiyum Depression, which lies below sea level in the desert southwest of Cairo. The name "Faiyum" comes from a Coptic word for "lake," and there is a natural lake here, once fed by an ancient branch of the Nile. The lake is small now, and most of the depression has been reclaimed by a canal from the Nile. The canal is an ancient one, though modernized. 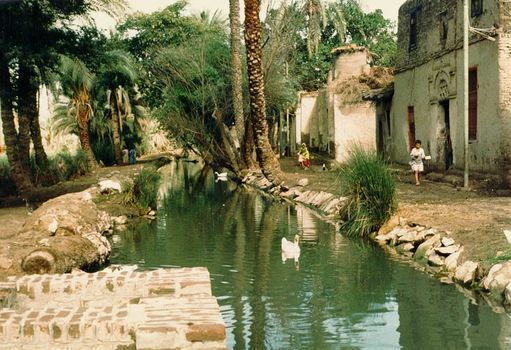 The canal's name hasn't changed, though: it's still the Bahr Yusef, or "River of Joseph." That's the Biblical Joseph. 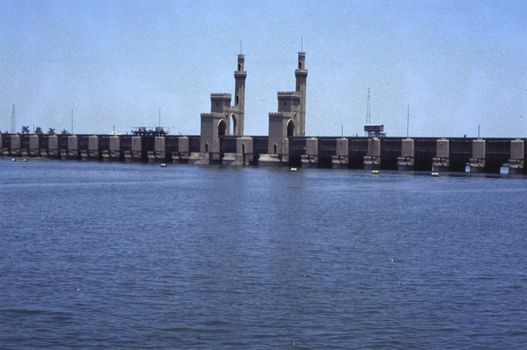 Controlling the Nile waters has been Job One in Egypt for almost 5,000 years. The view here is of a segment of the weir, downstream from Cairo, that controls water entering the delta. It's a 19th century product, started by French engineers but completed by English ones from India. They were led by Sir Colin Scott-Moncrieff, whose devotion to the peasantry amounted to a religious service. Not surprisingly the weir is known to every Egyptian within a hundred miles. 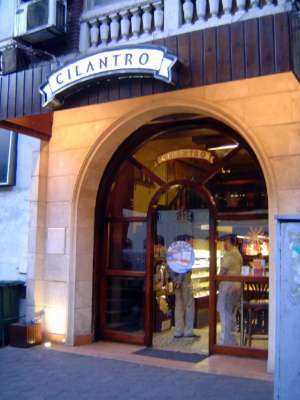 You can't ask a taxi drivers for "the weir, please," though; you have to use the Arabic qanatir, for "arches." 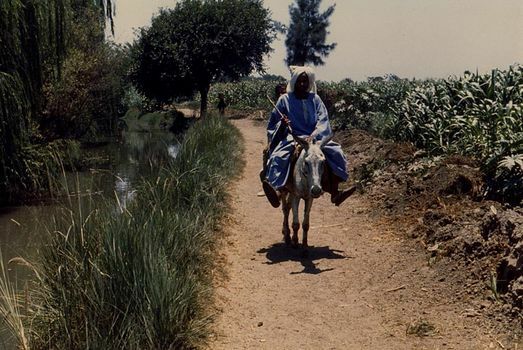 There are about 3,000,000 farms in Egypt. The average farm measures less than two acres; half cover less than one acre. 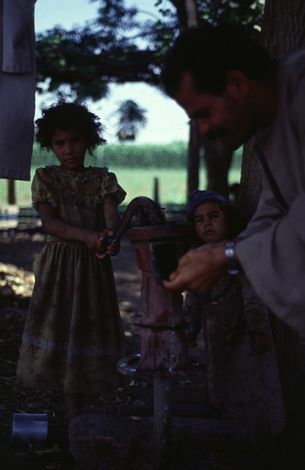 From that land, Egypt's farmers take winter crops of wheat and berseem (Egyptian clover) and summer ones of corn, cotton, and--in the delta--rice. About 40% of rural families supplement their income from non-farm sources, which often means that the husband moves to town while the wife stays behind to farm and care for the children. And those are the lucky ones: for every farm-owning family, there's another rural family that's landless and survives on farm wages. A moment before the previous picture was taken, the girl's father washed her face so she'd look her best. The pace of change has been accelerating for a century now, since the British more or less elbowed the French out of the country. 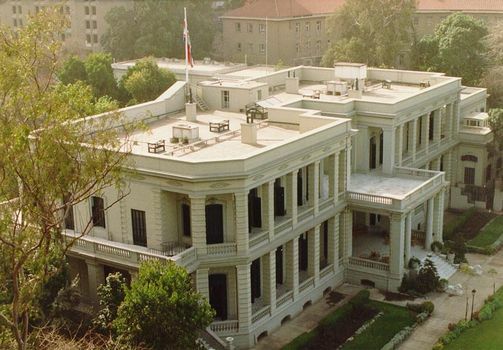 This is the British embassy, which dates back to the days of Lord Cromer and the lesser demigods who followed him until Egypt gained its independence in 1924. The property used to front on the Nile, but Gamal Abdul Nasser rammed a waterfront boulevard across the back lawn, which is now rimmed by a suitably forbidding wall. 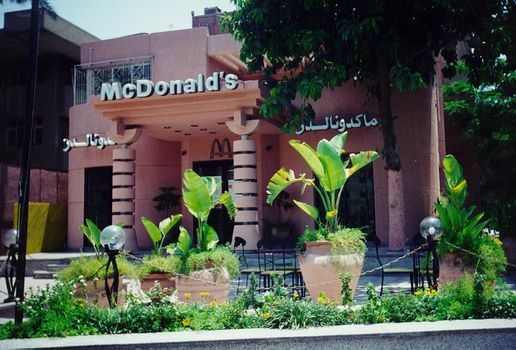 Movin' on: Cairo has several McDonald's. 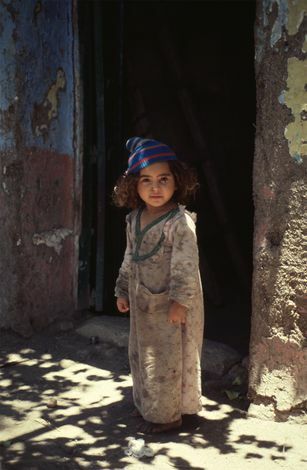 This one is on the way to Giza.